An easy step-by-step recipe for Rose Martini for Lovers, Valentines Day Rose Martini Recipe, Quick Rose Martini Recipe for Lovers, Free Rose Martini Recipe for Lovers, Best Lovers Recipe, Easy Martini Recipes, Exotic Rose Martini Recipe for Lovers, Rose Martini for Lovers Recipe. Make this Valentines Day special by making Rose Martini Recipe for Lovers yourself. This one is a perfect beverage for lovers on occasions as special as Valentines Day. Since it contains rose, eternal for love, it has the power to make an evening romantic for lovers with its exotic rose flavor. · Combine water and sugar in a small saucepan and bring it to a boil. Then simmer and keep stirring till the sugar dissolves. · Cool a bit and then add vodka, limejuice and rose water while stirring the mixture. · Take a cocktail shaker and will it with ice cubes and add one-fourth of the martini mixture and shake a bit. 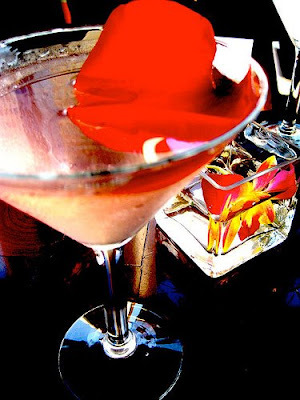 · Now, strain the shaked martini in two glasses and garnish with rose petals and serve chilled.